Please contact me and let me know what items you need. I will contact you and let you know costs of items and shipping costs. 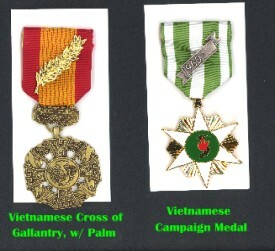 Everyone who served in Vietnam was awarded the Vietnamese Cross of Gallantry with Palm and the Vietnam Campaign Medal. If you are one of the many vets who are short these medals, I have them in stock.